This article provides an overview of canine infectious respiratory disease (CIRD) from the perspective of clinical manifestations and prevention, including vaccines and vaccination protocols. Kennel cough—it is one of the oldest descriptors of canine disease that appears in the veterinary literature. Aliases include canine cough, canine croup, infectious tracheobronchitis (ITB) and, most recently, canine infectious respiratory disease (CIRD), also known as canine infectious respiratory disease complex (CIRDC). No matter the name, kennel cough is one of the most common canine respiratory infections. As a clinical syndrome, it has undergone changes in etiology, treatment recommendations, and options for prevention. The causes are many and include a growing list of pathogenic bacteria and viruses.1-7 The most notable changes, however, are found in vaccine options and claims of efficacy. Public health implications of Bordetella bronchiseptica, including risk associated with human exposure to live avirulent (intranasal and oral) vaccine. CIRD is well recognized as a contagious upper respiratory infection of dogs resulting from bacterial or viral infection. Because clinical manifestations vary according to the primary infecting agent, or combination of agents, CIRD is appropriately referred to as a respiratory syndrome. B bronchiseptica is commonly implicated as the principal cause of kennel cough;8 however, it is by no means the exclusive, nor is it the most virulent, pathogen implicated. Mycoplasma species (to a lesser extent), particularly M cynos. B bronchiseptica. B bronchiseptica is a gram negative bacterium capable of infecting multiple species, including humans, and it can potentially be transmitted from dogs (and possibly cats) to humans. Simply recovering B bronchiseptica from the respiratory tract of a coughing dog/cat does not define its role as causative. This pathogen has the unique ability to reside on epithelial cells of the upper respiratory tract as a commensal organism; hence, B bronchiseptica is commonly recovered from the respiratory tract of healthy dogs and cats. Canine pneumovirus (CnPnV): Recovered from respiratory tract of coughing dogs in the U.S.4 These dogs were found to carry other known pathogens involved in CIRD; however, the significance of CnPnV in causing, or contributing to, CIRD is still unknown. Clinical signs vary based on the individual agent responsible for infection in clinically affected dogs. Viral pathogens tend to be associated with clinical signs ranging from acute onset, highly contagious cough with expectoration of mucus that typically lasts 1 to 2 weeks to mild or no clinical signs (seroconversion only). Although coughing may persist for several weeks, dogs tend to effectively clear infectious viruses within 2 weeks following onset of signs. Bacterial pathogens tend to be associated with not only cough, but systemic illness characterized by mucoid to mucopurulent nasal and ocular discharge, fever, and loss of appetite. Other clinical findings include orthopnea, dyspnea, and even life-threatening pneumonia, particularly in young animals. Clinical signs can persist for several days or longer depending on treatment administered. Clinical illness associated with individual pathogens, however, does not necessarily represent the spectrum of clinical manifestations encountered in practice. For example, reports of dogs with confirmed CIV infection indicate that some simply seroconvert without developing significant respiratory signs, while others die. The occurrence of co-infection explains, at least in part, why predicting clinical outcomes of CIRD in individual dogs can be difficult, and it explains why well vaccinated dogs still develop kennel cough. Routine vaccination of dogs at risk for exposure is indicated and generally effective in reducing severity of cough in challenged dogs, despite the inability to immunize dogs against each of the known CIRD pathogens. 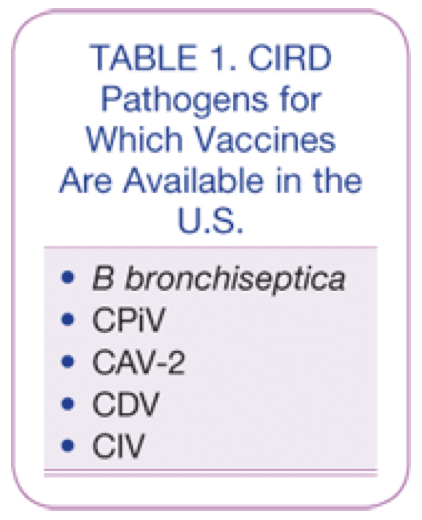 Table 1 lists the pathogenic viruses and bacteria associated with CIRD for which vaccines are available in the U.S.
Several types of vaccine (Table 2) are available for administration to dogs by the intranasal, oral, and parenteral (subcutaneous) route. The constituents and the routes of administration of commercially available vaccines vary. The route of vaccine administration indicated by the manufacturer must be strictly followed. Anecdotal observations suggest that empirical, daily administration of a broad-spectrum antibiotic may be of benefit in managing endemic respiratory disease associated with bacteria among shelter-housed dogs. While the cost of doxycycline may prohibit implementing programmatic treatment of all dogs entering a shelter, other less expensive, broad-spectrum antibiotics are available and may augment attempts to reduce the frequency or severity of CIRD in populations of co-housed dogs. Nosodes are liquid homeopathic preparations, sometimes called homeopathic vaccines, containing minute amounts of infectious material (tissue/discharge) collected from actively infected, unvaccinated animals. Intended for oral administration, proponents of nosodes claim efficacy in, not only preventing, but also treating infectious diseases in dogs and cats. Values for composition, concentration, and purity of ingredients are not standardized. Nosodes are not subject to regulatory oversight. No studies have been published documenting either safety or efficacy. Which vaccines should be administered? When should vaccines be administered? At what intervals should vaccines be administered? The overall quality of protection a dog derives from vaccination against CIRD is most likely correlated to the route of administration and the number of antigens administered. Noncore: Vaccines for B bronchiseptica, CPiV, and CIV are considered noncore, or optional, and indicated in dogs with known or likely risk for exposure to other dogs, especially in kennels or co-housed environments; most dogs fall into this category. Vaccination is not indicated for dogs with strictly limited, or no, exposure to other dogs. Note: The canine (enteric) coronavirus vaccine is not effective against the antigenically distinct canine respiratory coronavirus. Vaccines should only be administered to healthy animals. For example, administering a live, avirulent B bronchiseptica vaccine (intranasal or oral) to a dog concurrently receiving an antibiotic may exert an antibacterial effect on the vaccine antigen, resulting in reduced to no immunity. Intranasal vaccines can be administered as a single dose as early as 3 to 4 weeks of age (see manufacturer label instructions) because maternally derived antibody (IgG) does not interfere with mucosal immune responses (secretory IgA). Although impractical among individual household pets, puppies housed in high-risk environments (animal shelters) may benefit from early vaccination (ie, at 3–4 weeks of age). In this case, intranasal vaccine may need to be repeated at 2 to 4 week intervals until 12 weeks of age. It is not known whether the oral B bronchiseptica vaccine, which also induces local immunity, has efficacy in puppies less than 8 weeks of age. The parenteral B bronchisepticavaccine requires 2 initial doses, at a minimum interval of 2 weeks, with the first dose administered to dogs 8 weeks of age or older. Assessment of exposure risk is particularly important when selecting a vaccine. For dogs with limited risk for exposure, administration of any combination of parenteral, oral, or intranasal vaccines is indicated. 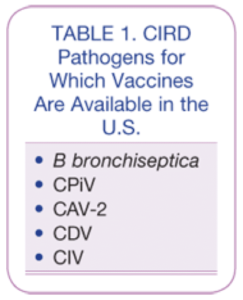 In high-risk environments, however, administering either the oral or parenteral B bronchiseptica vaccines alone limits the scope of protection to B bronchiseptica; neither product contains vaccine against CPiV or CAV-2. Dogs initially vaccinated with parenteral B bronchiseptica vaccine are not expected to derive protective immunity until 5 to 7 days following administration of the second dose, that is, not earlier than 19 to 21 days following administration of the first dose. Reports from veterinarians indicate that parenteral and oral vaccines are easiest to administer and best tolerated by individual dogs. A small number of dogs will aggressively resistintranasal vaccination; resistance to intranasal vaccination may warrant changing to oral or parenteral administration (see Change of Administration Route). The most recent studies (see Studies on B bronchiseptica Vaccine Administration) assessing routes of administration center on B bronchiseptica vaccination. These studies highlight the role of mucosal immunity in protecting dogs against exposure to B bronchiseptica. Similar comparative studies assessing the quality of protection derived from intranasal versus parenteral CPiV and CAV-2 vaccine administration have not been published. Following challenge, had significantly lower shedding and lower cough scores compared to dogs vaccinated parenterally. A 2013 study14 compared the quality of protection in dogs vaccinated against B bronchiseptica by intranasal, oral, and parenteral routes. Following challenge, cough scores in all dogs were reduced when compared to control dogs. However, dogs vaccinated by intranasal and oral routes had significantly lower cough scores compared to those vaccinated parenterally. Affinity of avirulent live B bronchiseptica for respiratory epithelium. When administering intranasal vaccine to small breeds, particularly small brachycephalic breeds, the volume of diluent may be arbitrarily reduced when reconstituting lyophilized vaccine antigen. Doing so reduces the volume of vaccine that reaches the nasopharynx without reducing antigen concentration or vaccine efficacy. Due to the absence of published studies, administering a dose of oral B bronchiseptica vaccine by mixing the dose with food is not recommended. Doing so may result in significantly reduced antigen contact with mucosal surfaces and, thus, ineffective immunization. When administering an intranasal vaccine, veterinarians may encounter sufficient resistance in some dogs to warrant switching to a parenteral or oral vaccine. Switching from Intranasal to Parenteral. Intranasal vaccination may not consistently result in significant levels of serum IgG. Therefore, administration of 2 parenteral doses, 2 to 4 weeks apart, is recommended, regardless of the dog’s age when the dosing route is changed. The dog may be revaccinated annually thereafter. Switching from Intranasal to Oral. If switching from intranasal to oral vaccination, a single oral dose is indicated to effectively protect against B bronchiseptica infection. Vaccines indicated for protecting dogs against CIRD must be administered in accordance with the manufacturer’s recommendations. See The Do Nots of Vaccine Administration. An intranasal B bronchiseptica vaccine by the oral route because concentration of B bronchiseptica in an intranasal vaccine is less than that in an oral vaccine. The intranasal vaccines containing modified-live viruses (CPiV and CAV-2) by the oral route because an intranasal vaccine, if administered orally, is not expected to induce protective immunity. The parenteral B bronchiseptica vaccine by the oral or intranasal route; the parenteral vaccine is an inactivated cell culture extract and not effective if administered orally or intranasally. 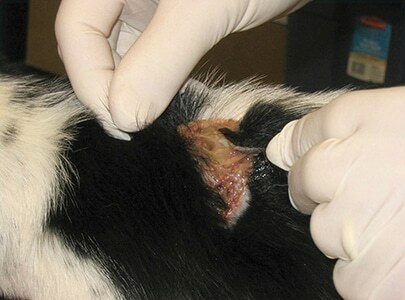 An oral or intranasal (attenuated) B bronchiseptica vaccine by the parenteral route because some dogs may develop injection-site granulomas or abscesses (Figure). Parenteral CDV + canine parvovirus (CPV) + CAV-2 vaccine combined with CPiV is among the multivalent vaccines most commonly administered to dogs in the U.S. and Canada. Because intranasal B bronchiseptica vaccine may also include vaccine against CPiV or CPiV + CAV-2, dogs can receive both parenteral and intranasal vaccine for the same virus. There is no risk associated with doing so, even if administered during the same appointment. Immunologically, dogs vaccinated against B bronchiseptica, CPiV, and CAV-2 by both parenteral (circulating IgG) and mucosal (secretory IgA) routes (oral and intranasal) at the same time may derive a greater degree of protection than those vaccinated either parenterally or mucosally. However, no scientific studies exist that confirm this. The intricacies of systemic versus mucosal immunity are rather complex, and few studies are available that even attempt to “measure” mucosal immune responses. Mucosal immunity to B bronchiseptica does appear to involve mechanisms other than secretory IgA. However, further discussion of this topic is outside the scope of this article. Published reports document the role of B bronchiseptica as a primary respiratory pathogen in humans, and it can be transmitted from dogs, cats, and rabbits to humans and other animals. Postvaccinal sneezing and/or coughing are commonly reported in dogs that recently received intranasal vaccines. Reports of human infection with B bronchiseptica have raised concerns about administration of avirulent live (oral or intranasal) vaccine to dogs owned by immunocompromised individuals and families with young children (see Was It the Vaccine?). Figure. Spontaneous rupture of a subcutaneous abscess in a dog 5 days following parenteral administration of an intranasal vaccine containing avirulent live B bronchispetica. One unpublished case report described the case of a 14-year-old boy who was inadvertently sprayed in the face with a dose of intranasal B bronchiseptica + CPiV vaccine that was intended for the child’s pet dog.20 Five days later, the boy developed a pertussis-like cough that persisted for 3 to 4 months. However, confirmation that the illness was causally associated with vaccine exposure was never accomplished. To date, there are no published studies confirming human infection and illness associated with exposure to recently vaccinated dogs. Special precautions to avoid human contact with recently vaccinated dogs (oral or intranasal route) do not appear warranted. Although anecdotal, I have voiced concern about the risks associated with veterinarians being directly exposed to intranasal (attenuated) vaccines at time of administration. To date, despite the large number of veterinarians reporting exposure, there is no evidence suggesting development of respiratory signs among those exposed to intranasal or oral vaccines. Canine infectious respiratory disease is still among the most frequently encountered respiratory infections reported in dogs. Despite the availability and widespread use of vaccines for many of the viral and bacterial pathogens implicated, infections are still reported. The discovery of new respiratory pathogens for which vaccines are not currently available highlights the fact that even well vaccinated dogs can still develop CIRD. Due to the contagious nature of the organisms involved, animal shelters, dog day-care centers, rescue organizations, and veterinary hospitals continue to be recognized as high-risk environments for development of CIRD. Ford RB. Canine infectious respiratory disease. In Greene CE (ed): Infectious Diseases of the Dog and Cat, 4th ed. St. Louis: Elsevier Saunders, 2012, pp 55-65. Pecoraro HL, Bennett S, Huyvaert KP, et al. Epidemiology and ecology of H3N8 canine influenza viruses in US shelter dogs. J Vet Intern Med 2014; 28(2):311-318. Priestnall S, Erles K. Streptococcus zooepidemicus: An emerging canine pathogen. Vet J 2011; 188(2):142-148. Renshaw RW, Zylich NC, Laverack MA, et al. Pneumovirus in dogs with acute respiratory disease. Emerg Infect Dis 2010; 16(6):993-995. Decaro N, Martella V, Buonavoglia C. Canine adenoviruses and herpesvirus. Vet Clin North Am Small Anim Prac 2008; 38(4):799-814. Erles K, Brownlie J. Canine respiratory coronavirus: An emerging pathogen in the canine infectious respiratory disease complex. Vet Clin North Am Small Anim Pract 2008; 38(4):815-825. Buonavoglia C, Martella V. Canine respiratory viruses. Vet Res 2007; 38(2):355-373. Ford RB. Bordetella bronchiseptica: Beyond kennel cough. In Bonagura JD, Twedt DC (eds): Kirk’s Current Veterinary Therapy XIV, 14th ed. St. Louis: Elsevier Saunders, 2009, pp 646-649. Mattoo S, Cherry JD. Molecular pathogenesis, epidemiology, and clinical manifestations of respiratory infections due to Bordetella pertussis and other Bordetella subspecies. Clin Microbiol Rev 2005; 18(2):326-382. Welborn LV (chair), DeVries JG, Ford RB, et al. 2011 AAHA canine vaccination guidelines. JAAHA 2011; 47(5):1-42. Available at aahanet.org. Gore T, Headley M, Laris R, et al. Intranasal kennel cough vaccine protecting dogs from experimental Bordetella bronchiseptica challenge within 72 hours. Vet Rec 2005; 156(15):482-483. Bey RF, Shade FJ, Goodnow RA, Johnson RC. Intranasal vaccination of dogs with live avirulent Bordetella bronchiseptica: Correlation of serum agglutination titer and the formation of secretory IgA with protection against experimentally induced infectious tracheobronchitis. Am J Vet Res 1981; 42(7):1130-1132. Hess TJ, Parker DS, Hassall AJ, Chiang Y. Evaluation of efficacy of oral administration of Bordetella bronchiseptica intranasal vaccine when used to protect puppies from tracheobronchitis due to B bronchiseptica infection. Intern J Appl Res Vet Med 2009; 9(3):300-305. Larson LJ, Thiel BE, Sharp P, Schultz RD. A comparative study of protective immunity provided by oral, intranasal and parenteral canine Bordetella bronchiseptica vaccines. Intern J Appl Res Vet Med 2013; 11(3):153-160. Ellis JA, Krakowka GS, Dayton AD, Konoby C. Comparative efficacy of an injectable vaccine and an intranasal vaccine in stimulating Bordetella bronchiseptica-reactive antibody responses in seropositive dogs. JAVMA 2002; 220(1):43-48. Davis R, Jayappa H, Abdelmagid OY, et al. Comparison of the mucosal immune response in dogs vaccinated with either an intranasal avirulent live culture or a subcutaneous antigen extract vaccine of Bordetella bronchiseptica. Vet Ther 2007; 8(1):32-40. Toshach K, Jackson MW, Dubielzig RR. Hepatocellular necrosis associated with the subcutaneous injection of an intranasal Bordetella bronchiseptica-canine parainfluenza vaccine. JAAHA 1997; 33(2):126-128. Hemsworth S, Pizer B. Pet ownership in immunocompromised children—a review of the literature and survey of existing guidelines. Eur J Oncol Nurs 2006; 10(2):117-127. Woolfrey BF, Moody JA. Human infections associated with Bordetella bronchiseptica. Clin Microbiol Rev 1991; 4(3):243-255. Berkelman RL. Human illness associated with use of veterinary vaccines. Clin Infect Dis 2003; 37(3):407-414. R ichard B. Ford, DVM, MS, Diplomate ACVIM & ACVPM (Hon), is Emeritus Professor of Medicine at North Carolina State University’s College of Veterinary Medicine. He is a past president of the NAVC Conference and is a member of the scientific program committee. He serves on the AAHA Canine Vaccination Task Force and AAFP Feline Vaccination Advisory Panel. He received his DVM from Ohio State University and completed an internal medicine residency at Michigan State University.